This post was kindly contributed by The SAS Dummy - go there to comment and to read the full post. This blog post could be subtitled “To Catch a Thief” or maybe “Go ahead. Steal this blog. I dare you.”* That’s because I’ve used this technique several times to catch and report other web sites who lift the blog content from blogs.sas.com and present it as their own. Syndicating blog content is an honorable practice, made possible by RSS feeds that virtually every blog platform supports. With syndicated feeds, your blog content can appear on someone else’s site, but this always includes attribution and a link back to the original source. However, if you copy content from another website and publish it natively on your own web property, without attribution or citations…well, that’s called plagiarism. And the Digital Millennium Copyright Act (DCMA) provides authors with recourse to have stolen content removed from infringing sites — if you can establish that you’re the rightful copyright owner. Establishing ownership is a tedious task, especially when someone steals dozens or hundreds of articles. You must provide links to each example of infringing content, along with links to the original authorized content. Fortunately, as I’ve discussed before, I have ready access to the data about all 17,000+ blog posts that we’ve published at SAS (see How SAS uses SAS to Analyze SAS Blogs). In this article, I’ll show you how I gathered that same information from the infringing websites so that I could file the DCMA “paperwork” almost automatically. In my experience, the people who steal our blog content don’t splurge on fancy custom web sites. They tend to use free or low-cost web site platforms, and the most popular of these include WordPress (operated by Automattic) and Blogspot (operated by Google). Both of these platforms support API-like syndication using feeds. Since I don’t want to draw attention to the specific infringing sites, I’ll use an example of a popular (legitimate!) Blogspot site named “Maps Mania”. If you’re into data and maps (who isn’t?) you might like their content. In this code I use PROC HTTP to fetch the RSS feed, using “alt=json” to request JSON format and “max-results=100” to retrieve a larger-than-default batch of published posts. To design the map, I use an example of the XML feed from the blog that I want to examine. Once again, I’ll choose a popular WordPress blog instead of the actual infringing sites. In this case, let’s look at the Star Wars News site. I point my browser at the feed address is https://www.starwars.com/news/feed and save as an XML file. 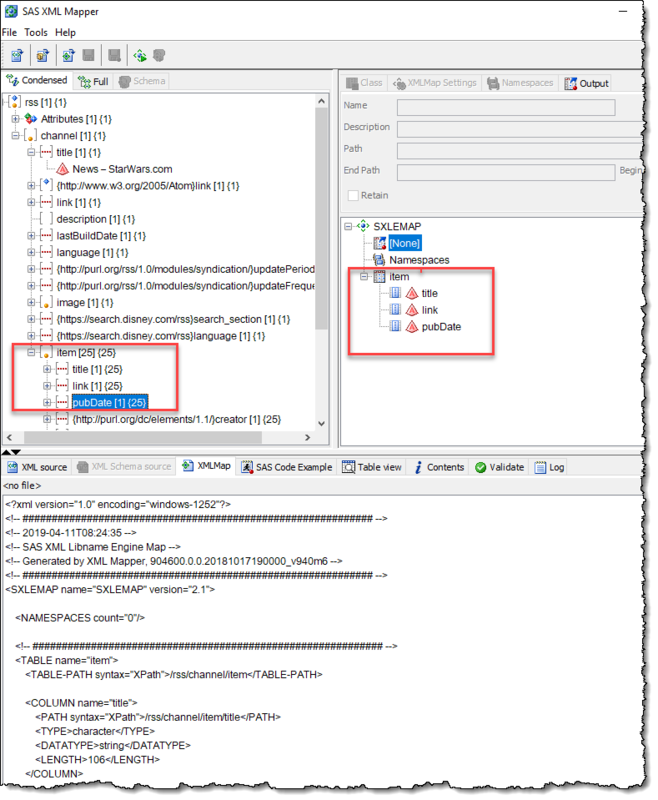 Then, I use SAS XML Mapper to Open XML (File menu), and examine the result. I found everything that I needed in “item” subset of the feed. I dragged that group over to the right pane to include in the map. 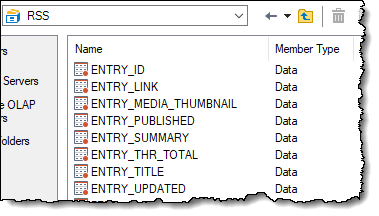 That creates a data set container named “item.” Then dragged just the title, link, and pubDate fields into that data set to include in the final result. The SAS XML Mapper generates a SAS program that you can include to define the map, and that’s what I’ve done with the following code. It uses DATA step to create the map file just as I need it. Because WordPress feeds return just most recent 25 items by default, I need to use the “pageid=” directive to go deeper into the archive and return older items. I used a simple SAS macro loop to iterate through 5 pages (125 items) in this example. Note how I specified the XMLv2 libname with the XMLMAP= option to include my custom map. That ensures that SAS will read the XML and build the table as I’ve designed it. Usually, matching by “article title” is the easiest method. However, sometimes the infringing site will alter the titles a little bit or even make small adjustments to the body of the article. (This reminds me of my college days in computer science, when struggling students would resort to cheating by copying someone else’s program, but change just the variable names. It’s a weak effort.) With the data in SAS, I’ve used several other techniques to detect the “distance” of a potentially infringing post from the original work. Maybe you want to see that code. But you can’t expect me to reveal all of my secrets, can you? * props to Robert “I dare you to knock it off” Conrad.